After a fabulous long weekend out of town celebrating friends' wedding, I made a quick Publix trip to grab some basics like milk and salad. We really been doing well at our quest to eat out of the freezer/stockpile lately so we haven't need much in the grocery department. We have made our way through a few pounds of chicken, a couple pounds of small pork tenderloins, a tupperware of frozen homemade soup, some frozen bread, veggies and a whole lot more the last week or so. 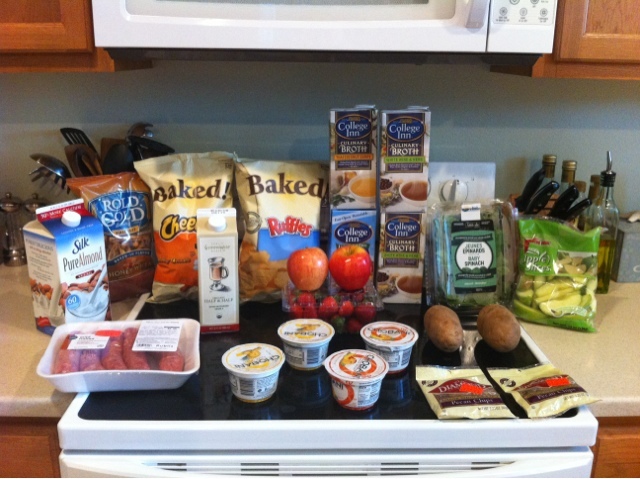 It was nice to save last week's grocery cash for eating out while we were out of town. I was very excited to take advantage of the Grocery Advantage flyer coupon for $1 off Publix meat WYB any College Inn Broth. With them being BOGO this week, it was a great time to use the coupon. I got even more excited when I randomly found some $1 off man. coupons from Facebook (don't think they are still available, think I printed them awhile ago) to make the deal even better. Our clearance section was also full of great deals so I was able to grab two bags of pecan chips for $1.40 each! I was well past $30 before coupons so I used one $5/$30 Winn Dixie coupon too.